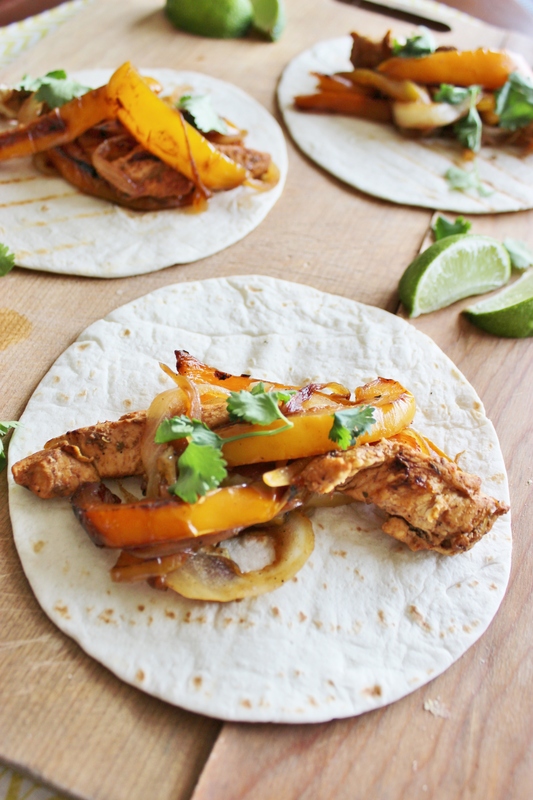 easy fajitas with grilled chicken, peppers, and onions. So, to tell you the truth, I am exhausted. Ty & I have been house hunting for several months, and last week involved several nights spent with our realtor. It’s so much more of an emotional process than I had anticipated! Lots of excitement followed by let downs… But my fingers are crossed that something good is just around the corner! In the meantime, I’m counting on simple recipes like this one to get me through some hectic weekdays. 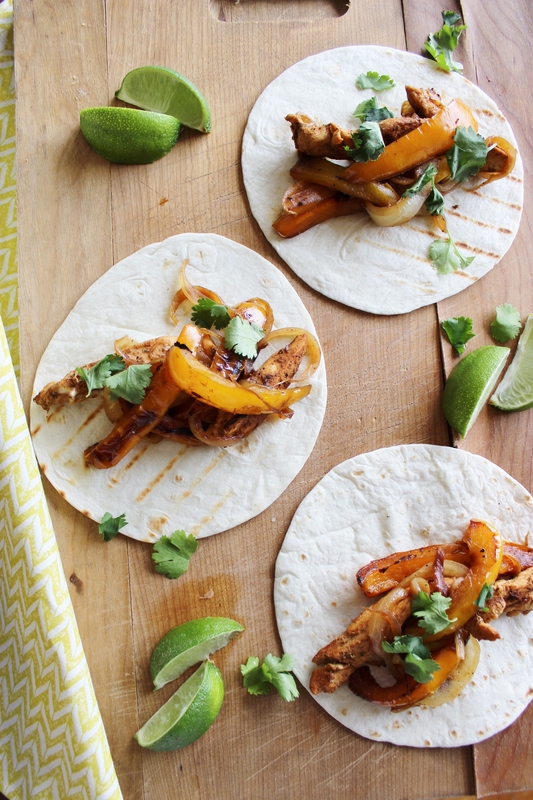 I’ve made double batches of these fajitas twice in the last two weeks to give us some great leftovers! Once skillet has heated, drizzle with olive oil to coat. 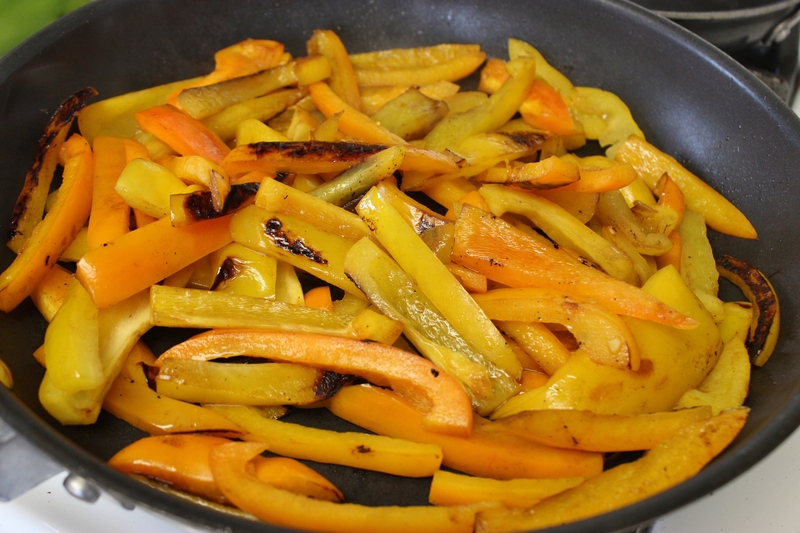 Place your sliced bell peppers in one layer on the skillet. Allow them to cook for several minutes without touching them–resist the urge to flip them! Turn one over as a test to see if its begun to char. If so, flip. Sear the other side until brown. Then, add the onions. Also allow them to char and turn golden. 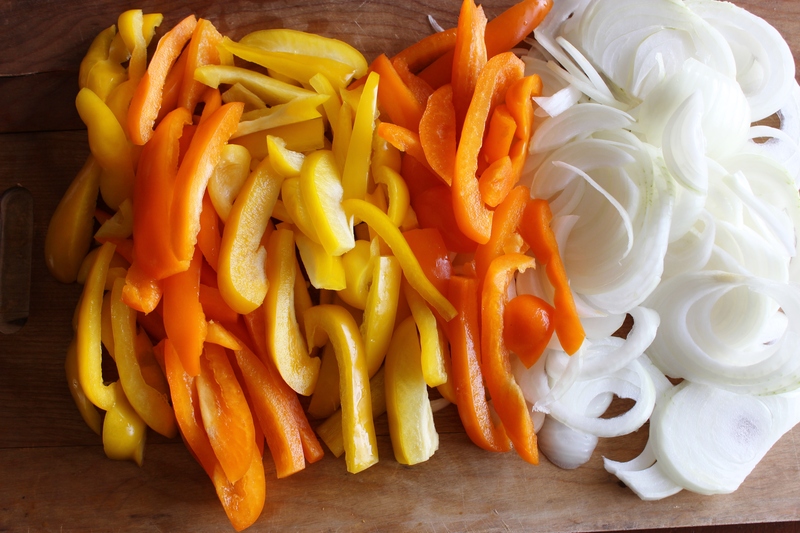 Once the onions have softened, remove the entire onion and pepper mixture from the pan and set aside in a bowl. Add another drizzle of olive oil to the pan. Add the sliced chicken strips in a single layer. Cook for 4-5 minutes on one side, then flip. Cook for another 5 minutes on the other side. Chicken should be browning. Once chicken is cooked, add the onion and pepper mixture back into the skillet and toss well. When you are ready to serve, remove the skillet from heat. I warmed my tortillas on a grill pan until they were slightly charred. Spoon a generous serving of the chicken fajita mixture onto each tortilla. You are currently browsing entries tagged with fatijas with charred peppers at The Cheesy Kitchen.